When I saw these delightful little morsels on Pinterest, I knew we had to try them. They are similar to these Party Ham Sandwiches I make when I need a quick dinner. The glaze is what makes them. It is so incredibly yummy. 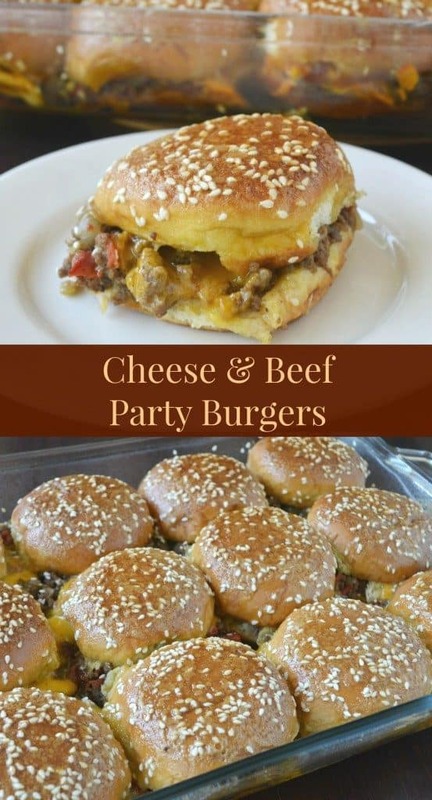 The recipe for these Cheese & Beef Party Burgers came from Kevin & Amanda, one of my absolute favorite blogs. She calls them “Diamond Burgers” and makes them on dinner rolls. I used Pepperidge Farm Slider Buns. I would recommend that you don’t make them on the Kings Hawaiian Rolls or any other really soft bun, they don’t hold up as well to the beef mixture. I have found a denser bread is better. Cook the ground beef and onion in a large skillet until cooked through. Drain. Season with the kosher salt, pepper, cumin, mustard powder, paprika and garlic. Cook for a couple of minutes to let the spices "bloom". Stir in the drained Ro-Tel tomatoes and cook a couple more minutes until warmed through. Place the bottom half of the buns in a greased 9 x 13 inch pyrex dish. Sprinkle the beef mixture evenly over the buns and top with cheese. Place the top ½ of the bun on the top. In a small saucepan, melt the butter and add the remaining glaze ingredients, except for the sesame seeds. Whisk until well combined and the sugar is dissolved. Spoon the glaze evenly over the tops of the sandwiches. Sprinkle evenly with sesame seeds. Thanks Marsha! You have a great weekend as well! Made these last week and used taco seasoning to sub the cumin, they were really good! Ohhh that sounds good. I will have to try that. Thanks Greta for stopping by! They aren’t bad but don’t live up to the hipe. We made them for football snacks and after trying one the guys left the rest and ate the other snacks. So I was left with half a pan of burgers nobody wanted. Good news the dogs had snacks for game too. So sorry they didn’t work for you. We’ve never had that problem here, they have always been a crowd favorite. Thanks for stopping by!